So it is one of my favorite past times every year to explain our family Christmas situation to everyone. For those with family down the street, it could be easier. But for those traveling for the holidays farther than 2 hours, it gets pretty sticky. Railroad women are a rare animal that solo-parent roughly 80-100% of the time. We are not SINGLE, but nonetheless could very well find ourselves alone during the holidays. When my RR (railroader) and I were in the military, we were able to anticipate when we would be apart. The railroad is very different and very spontaneous. There is not a schedule. If there is a schedule, it could change at a moment’s notice and is completely out of our hands. The above mentioned 2 hours is being generous. Other circumstances nullify that 2 hour window. Bottom line is, it is a game day decision if I have to strong arm the kids by myself or if I will have help. If you are farther than one hour away, it either all of us or none of us on Christmas Day. The big kicker is that I don’t want my RR home alone, without his family on Christmas Day. Whether that is waiting for a call to go to work, coming home to an empty house, or us leaving him to go to another Christmas without him. I don’t want that. We would be happy to compromise but without set dates. I know this is nearly impossible for most people, but this is our life. As much as we love and appreciate you, our priorities our different because the RR is our livelihood. We WANT TO GO TO YOUR EVENT! But because of number one we don’t want you to count on us being there or not make enough food in case we are able to come. In some cases, we can make it but it’s just us (and the kids). Please understand our spouse wishes they could spend time with you and us during this time of year (or birthday or anniversaries or anything else for that matter). It is hard on them as it is hard on us doing these things alone. If anything, what we want for the holidays is understanding. Send us home with an extra plate of food, or be available when we are together. It is not easy, but it is especially not easy having to come up with colorful analogies to help you understand why we cannot give you a solid answer. 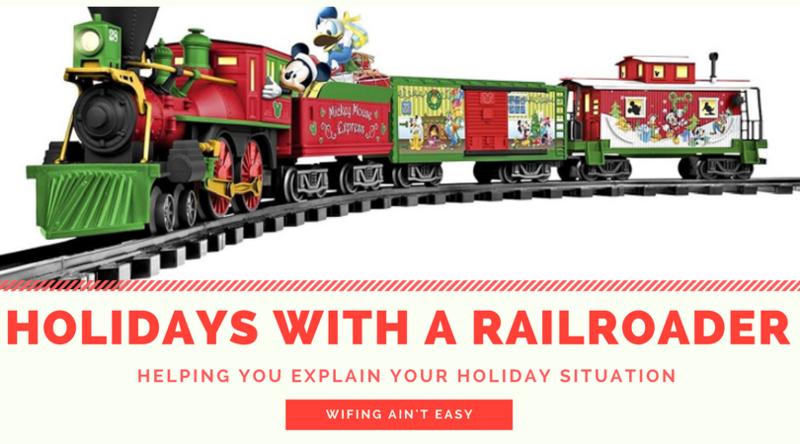 For more RR wife stories, you can check out these 6 Facts, The Condition of the Railroad Wife and A Snap Shot of Life on the Extra Board. Share as needed with friends and family and have a Happy Holiday Season.